OSWEGO, NY – Allen C. Hallett, a math teacher at Oswego Middle School, recently had an article, â€œThe Show Ring compared to the Sale Ring,â€ published in The Draft Horse Journal. Based in Waverly, Iowa, it has a readership of more than 30,000. 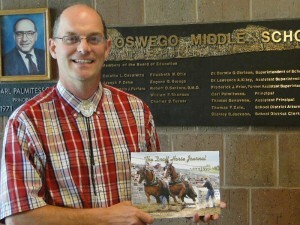 Hallett has been a teacher in the Oswego City School District for 20 years and has raised Belgian draft horses for three decades. He and his family are well-known showmen having shown 13 state fair champions and having judged multiple shows across the United States and Canada. Hallett holds a copy of the journal.